Guitar-Antics Blog » Meeting Hank Williams Jr.
A few weeks before we opened the show for George Jones we were at that same venue setting up for the coming weekends show (when we were the headline act) and guess who walked in ? 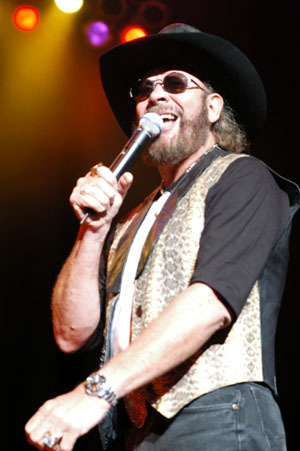 Yep, it was Hank Williams Jr. along with a man in a nice suit. It was his promoter, they were there discussing an upcoming concert Hank was to play there. Unfortunately we did not get to open for Hank due to playing there already the week before, however, Hank did invite us to have a beer with him at the bar (that he paid for) and after talking to us for a while, sent his promoter out to the car to get an 8 x 10 photo of himself at the Grand Ole Opry which he autographed for us. I will never forget the look on that guys face when he was asked to do that ! Of course I still have the picture and will never forget meeting and being treated as equal by such a legend and influence in my music career.We could have seen the show for free but we were booked somewhere else that night. In the weeks to follow we got to open for George Jones to make up for not getting to open for Hank. Either way I feel very lucky.